Businesses want to innovate faster because they know successful innovators tend to be the most successful businesses. Yet if you survey IT and finance leaders, as we did recently in conjunction with Vanson Bourne, a technology market research firm, you will find many are dissatisfied with the pace of innovation happening in their organizations. The tremendous potential of digital business is very much on their minds, but they see too much of their actual IT spending going to what’s often referred to as “keeping the lights on” spending – basic systems and infrastructure maintenance. Basic systems maintenance and support activities typically get a bad rap, given that by definition this is the essential work of keeping core IT systems running. If you dislike keeping the lights on, just wait until they blink off! Woe be the CIO who must explain why customer information is inaccessible or why finance is unable to close the quarter because of a system failure. What makes the distribution of spending frustrating, however, is that businesses want to stretch way beyond the basics. They want to make sure the basics are covered but at a reasonable cost, with budget left over for trying new things that can have a significant impact on the business. They want core business systems managed in ways that make the organization more agile, opening up new possibilities rather than presenting obstacles. In other words, shouldn’t spending on basic IT activities like running financial software be commoditized by now, leaving more room for innovation? Yet if you ask people why their organization’s budget priorities are skewed, they identify “keeping the lights on” not just as a symptom but as a cause. Asked to name the single biggest obstacle to IT innovation, survey participants put spending on basic maintenance and support activities at the top of the list. What are the biggest obstacles to IT innovation? This global survey, titled “The State of IT Innovation,” is based on responses from 900 CIOs, IT leaders, and financial decision makers from a broad range of industries, located in North America, South America, Europe, Middle East and Africa, and Asia-Pacific. 90% indicated that budget allocation for IT innovation must increase by 10% in the coming years to adapt to the rapid introduction of new technologies. 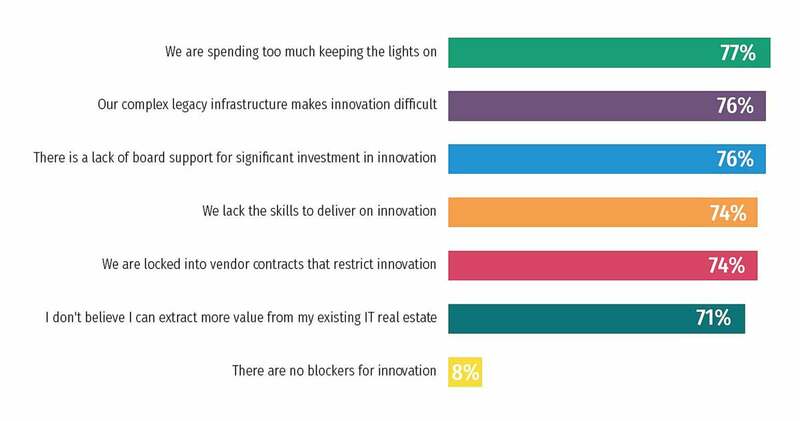 70% stated that their current technology providers do not help them innovate. The research validates an important point about the importance of rebalancing spending priorities between “keeping the lights on” versus transformational initiatives. This is widely understood, but it’s still not happening as fast as business leaders would like. Shifting dollars toward innovation takes both leadership and technological vision. The innovative CIO must not only find the savings but ensure the money is redirected to innovation initiatives. Otherwise, the company’s financial leaders may happily collect the savings and redirect the money elsewhere. Innovation is not easy – if it was, everyone would be an innovator – but it is worth the effort because only exceptional effort, intelligence, and invention will produce exceptional results. Real success requires “keeping the lights on,” absolutely, but not stopping there. To download an eBook summary of the survey, “The State of IT Innovation: Priorities and Challenges,” click here. To view the on-demand webcast on this topic, click here. 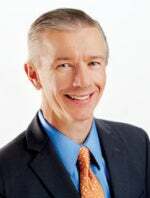 David Rowe is a 29-year veteran of the enterprise software industry with proven experience formulating, building and marketing technology solutions for both large international software firms and high-growth technology start-ups. He has been a featured speaker at technology and marketing conferences and was named as one of the Top Chief Marketing Officers of 2010 by the CMO Institute. Mr. Rowe oversees all global marketing for Rimini Street.